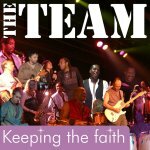 Please take time to listen to the Team's album - 'Keeping The Faith', click cover to listen or purchase. Thank you for visiting the guestbook. Feel free to contribute to the book. Archive Guestbook from its commissioning to 2011. Due to Spambots e-mail addresses will not be displayed but can be supplied on request to the webmaster, stating the date and time of entry. Comments: Just wanted to say ive been a huge fan for years! I am in my late 50's and still enjoy the music of the 70's and Edwin Starr was one of my favorites!! Comments: I first saw Edwin in 1983 and then again in 84 twice as part of the Northern scene in Bradfrod and Leeds. Listening to the band on Saturday night just brought it all back. A fantastic celebration of soul and just having a gret time. Dont ever stop. p.s. put agent oo soul and back street on the play list. They rock! Comments: I was lucky enough to have supported Edwin, twice. Once at the Palace Hotel, in Manchester and once at Pop in the Park Cambridge. A truly awesome performer! Comments: So pleased to see that at long last Edwin is being recognised with his induction into the R&B Hall of Fame.Hope Andre, his son can make it to collect the award on behalf of his father. Comments: Edwin: Last night your brother Angelo and the Team did you proud, along with many of your friends who performed with energy and feeling to celebrate your life and work. Everyone there was truly bound together by your music. Despite your sad passing ten years ago your memory and music live on in the hearts of so many.